Michigan Natural Shoreline Partnership encourages best practices. The Michigan Natural Shoreline Partnership recently launched a program to help lakefront homeowners understand best practices to protect their shoreland and inland lakes. The new Michigan Shoreland Stewards Program will recognize inland lake property owners who are using healthy property management practices to protect their inland lakes and offer tips to further improve the shoreline. The Michigan Natural Shoreline Partnership promotes the use of shoreline best management practices to protect and improve lakeshore habitat and water quality in Michigan’s inland lakes. It is a collaboration of state agencies, academia, nonprofit organizations and private industry. High-impact development activities like seawall and other shoreline structure installation, natural vegetation clearing, and removing aquatic plants and fallen trees from the lake change the ecosystem and allow increased stormwater runoff, increased shoreline erosion and loss of habitat. As the lakeshore habitat deteriorates, animals such as birds, reptiles, amphibians and fish lose important breeding and feeding areas. The 2007 National Lake Assessment, conducted by DEQ in conjunction with the U.S. Environmental Protection Agency, indicates the loss of lakeshore habitat is the biggest threat to the overall health of Michigan’s inland lakes. Shoreline and nearshore habitat was shown to be in poor condition in more than 40 percent of Michigan‘s inland lakes, and in only fair condition in another 20 percent of lakes, according to the survey. The Michigan Shoreland Stewards Program addresses this problem by providing recognition for property owners who are fostering natural shorelands on their properties. The program uses a web-based survey to ask property owners how they manage their properties to determine areas for improvement and potentially qualify for a certificate of recognition. Recognized Shoreland Stewards have the option of purchasing a low-cost sign for their properties to promote natural shorelines on their lake. For more information about the Michigan Natural Shoreline Partnership, visit www.mishorelinepartnership.org. 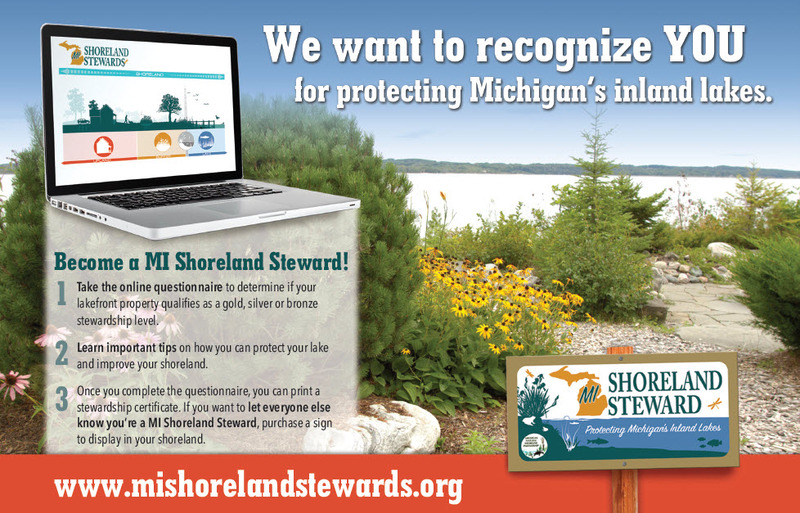 To take the Michigan Shoreland Stewardship Program survey, visit www.mishorelandstewards.org. /Note to editors: Accompanying photos are available below for download. Suggested captions follow. MSSP gold sign.jpg: This Michigan Shoreland Stewards Program sign is available to property owners recognized for their efforts.